The D-day was the morning of the 6th of April at the Dr. John Garang mausoleum ground when the third calendar of the event took place. They all woke up in doves and headed to the ground where President Salva Kiir was to officiate in the take- off ceremony which had attracted thousands of locals and a number of international athletes. They were ready for the race under the theme “Thanksgiving Race for Restoring Peace, Unity and Love” The race was organized by the Great South Sudan Run kicked off early in the morning and after its conclusion, President Kiir during his speech recorgnised the chairman and founder of the event, Ayesheshim Teka who the head of State awarded citizenship as a recognization to his great contribution and hard work in supporting the people of South Sudan.Teka is an Ethiopian Businessman and the Chief Executive Officer of Dembesh Hotel. Teka has helped in building six police stations and eight health facilities in some of the remote areas of South Sudan. He has also promised to contribute to the development of sports activities in the country. “Teka was the brain behind this great run and now he becomes a citizen of South Sudan by nationality. This is to congratulate him really and to assure him that all the efforts he has been doing cannot go in vain without being recognized by the people of South Sudan,” Kiir announced during the celebration at Dr. John Garang Mausoleum. The first Great South Sudan Run was an initiative pioneered byTeka, to help people of South Sudan who had been affected by famine. Kiir encouraged the runners to use the association to promote peace in the country. President Kiir assured that Great South Sudan Run would continue to enable South Sudanese runners to compete regionally and internationally. Kiir said that great run started as small event but now it had become one of the biggest events that attracted many great runners from the neighboring countries. “I want to assure you that this program “Great South Sudan Run” will not stop and I want to assure South Sudanese athletes of trainings so that they could compete with their colleagues regionally and internationally,” said Kiir. He said though there was slow implementation of the peace agreement, South Sudan would not go back to war so that the Country continues with development. In his speech, Teka said principal parties to the agreement had done well in signing the revitalized peace agreement that enabled Great South Sudan Run to succeed. He said the government stood with the organizers that contributed to a great achievement to South Sudanese people because Great South Sudan Run was an initiative pioneered to help people who had been affected by famine. The head of African Union Liaison Office in South Sudan Ambassador Joram Mukama Biswaro said that the event was the remainder to the government and opposition that sustainable peace was needed in the Country. He said cooperation, sharing and sports activities were potential to bring South Sudanese together “Sports is a powerful tool to build peace because African Union believe that supporting sports encouraged unity and cooperation among the people, “said Mukama. ”This event will go beyond Juba if we have silenced the guns and my office is ready to provide all the available support,” he added. The great run was first registered as an initiative in 2017 under the theme “Peace, Reconciliation and Healing”. In February 2017, the National Bureau of Statistics and three UN agencies declared famine in some parts of the country, especially the former Unity State. In a run for Peace race, South Sudan citizens comprising of youth, women, children and elderly filled Dr. John Garang Mausoleum to participate in a 10 Kilometer Marathon.On that Saturday morning, thousands of South Sudanese assembled at the Freedom Square waiting for the whistle to be blown to start running. They were joined in the race by International Athletes mainly from Ethiopia, Eritrea, Uganda and Kenya among other countries. The purpose was to run for peace, Unity and reconciliation.The Marathon seemed to be a new dawn for peace in South Sudan as most citizens hoped to celebrate the day before the Unity government is formed in May. It started in 2017 as Fundraising event to help people who had been affected by famine in South Sudan. More than 10 million Pounds was been raised from Great Run Marathon that was held in Juba in April of that year. The event saw President Salva Kiir Mayardit and other leaders run for peace. Ethiopia recognized as one of the countries with best athletes dominated top positions both men and women athletes. 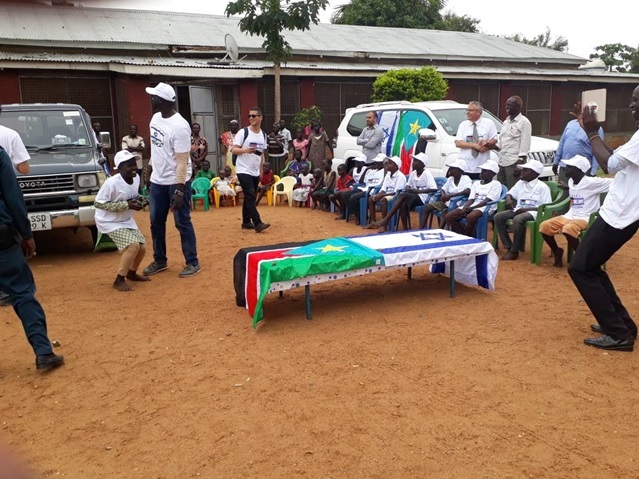 During the preparation, Juba Monitor Centre took the lead in registering participants who were to run.In a bid to show commitment in celebrating the achievement of peace in South Sudan, Juba Monitor News Paper staff participated in the marathon. Moses Gum Degur and Mono David Danga were among thousands of athletes. The two were seen in front running for peace. It was an achievement for Juba Monitor to have its staff received bronze medals. About 3000 medals were given out to nearly 10,000 people. Top Winners of 10 kilometer marathon, both women and men were recognized for having performed well during the race. The names were called out and were awarded trophies. Number 1 to 3 were given trophies and some token of participation..